John was born in Bedfordshire in 1940. He served an apprenticeship with Vauxhall Motors in the Experimental Dept as a wood model maker and graduated as a car-body designer. 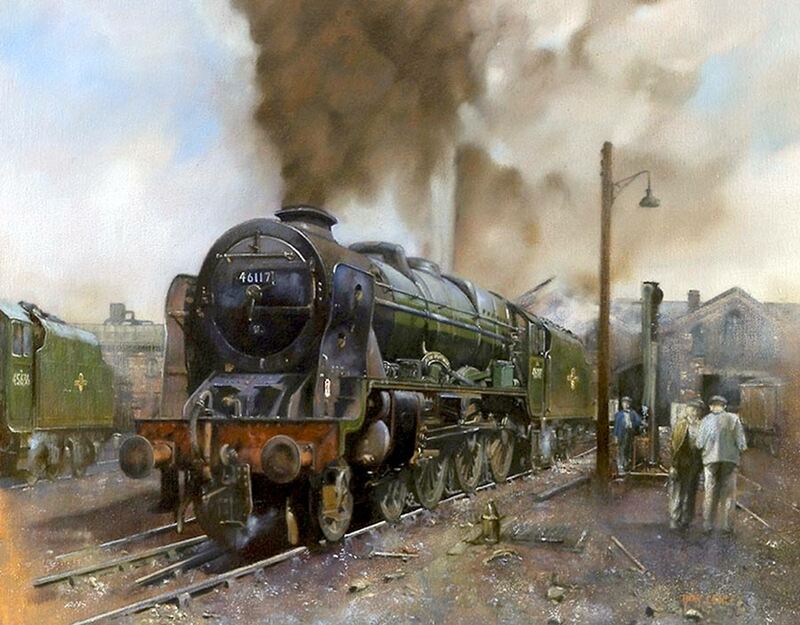 It is this experience and his continual love for art and design that trained his eye for detail; a necessary asset when it is a railway painting resting on the easel. John is grateful becoming elected GRA and now, having returned from seven years living in deepest Cornwall, he intends to be active in exhibiting and actually meeting Guild members. Besides exhibiting John's paintings have been published and commissioned. 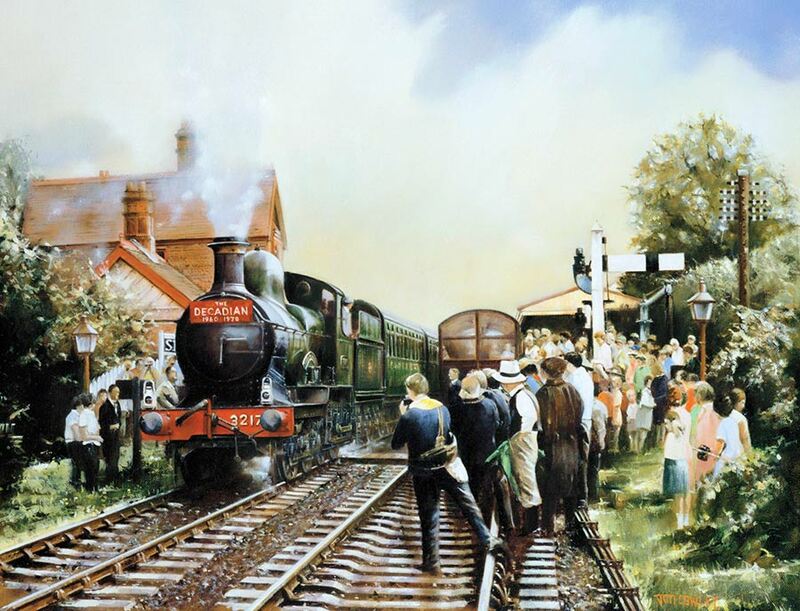 The Train Of Hope group, who support CLIC Sargent - Children's Cancer Charity, asked John if he would consider donating an appropriate canvas for sale. The painting was completed and in addition signed limited edition prints produced. On behalf of Virgin Trains, Richard Branson signed a small number of the prints, as did Pete Waterman. This painting appears in the gallery. Bluebell Railway 0-6-0 Dukedog 'Earl Of Berkeley' was built in 1938 and is an amalgamation of frames from a Bulldog and boiler and cab of a Duke class loco. Hence the derived name 'Dukedog'. Strange to see ten years of preservation at Sheffield Park celebrated with a Western Loco. In 1970 it is clear the celebrating crowd had heard little of health and safety. The 9F 2-10-0 standing by the water column on Holbeck Yard Leeds is 92223. The giant standards were designed at Brighton and first entered service in 1954. 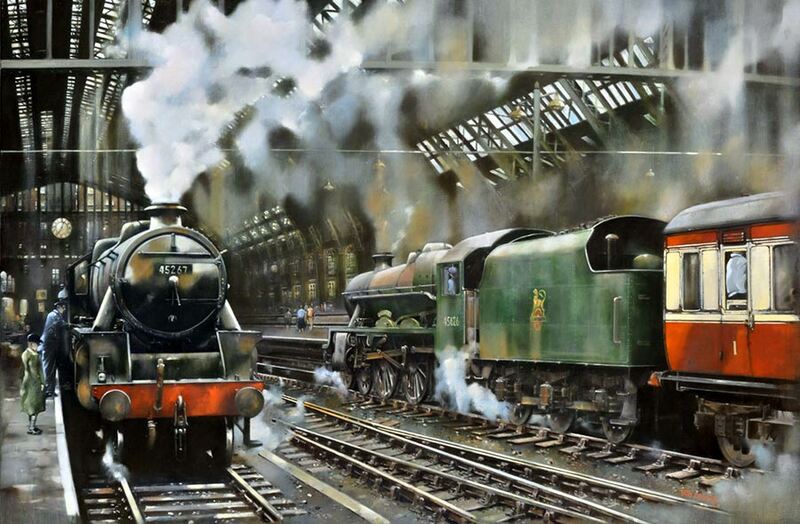 The locos proved to be more than reserves on the bench when their services were called to haul passenger trains, especially when other classes were being withdrawn towards the end of steam. Giant 2-10-0 9F 92211 is about to test the turntable on Holbeck shed. The remaining loco's are Jubilee 'Seaforth Highlander' and Jubilee Class 4-6-0 'Alberta' which in 1967 was the last Jubilee to be withdrawn from service. 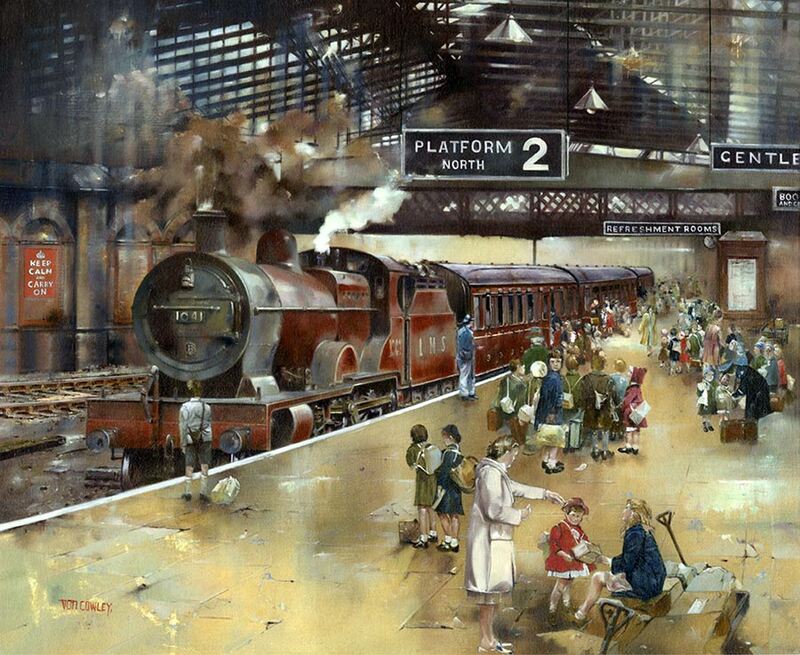 This painting depicts Evacuees about to depart Crewe on their way to temporary homes in Wales. 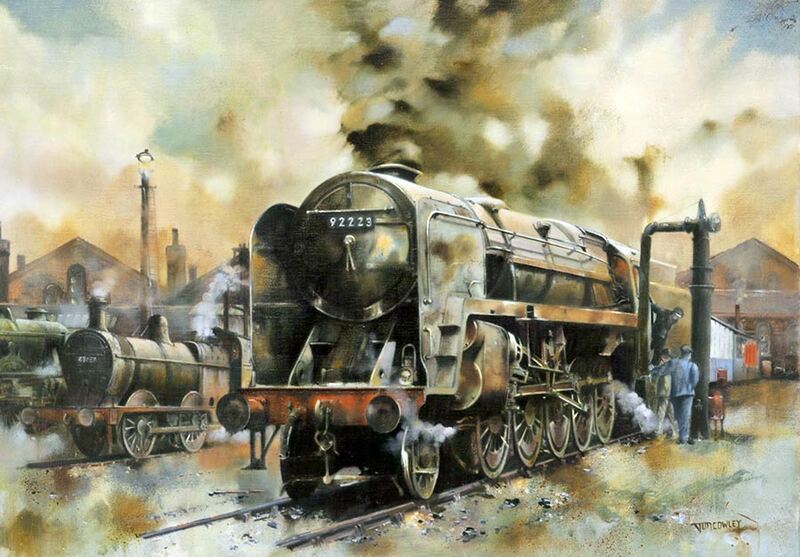 The year is 1940 and the Loco is Leicester based 3CYL 4-4-0 Compound 1041. Painted for the Manchester based charity 'Train Of Hope'. 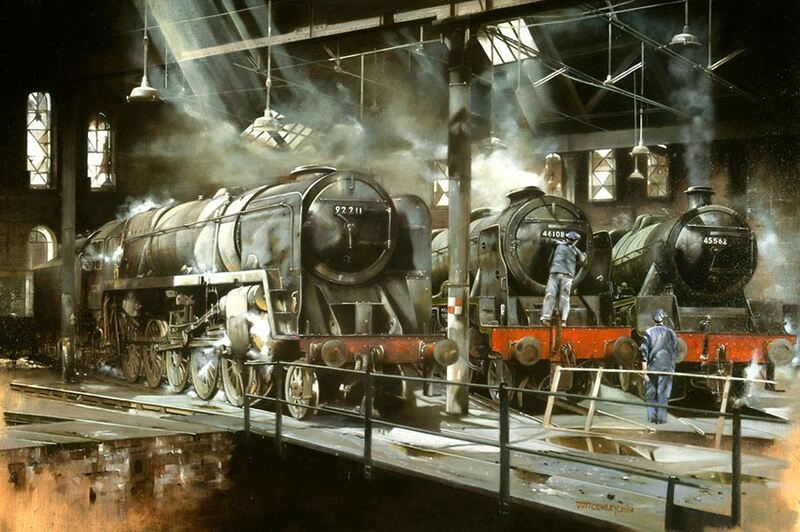 Stanier Coronation Class 4-6-2 Pacific 46229 'Duchess of Hamilton' takes centre stage on Willesden Yard London. 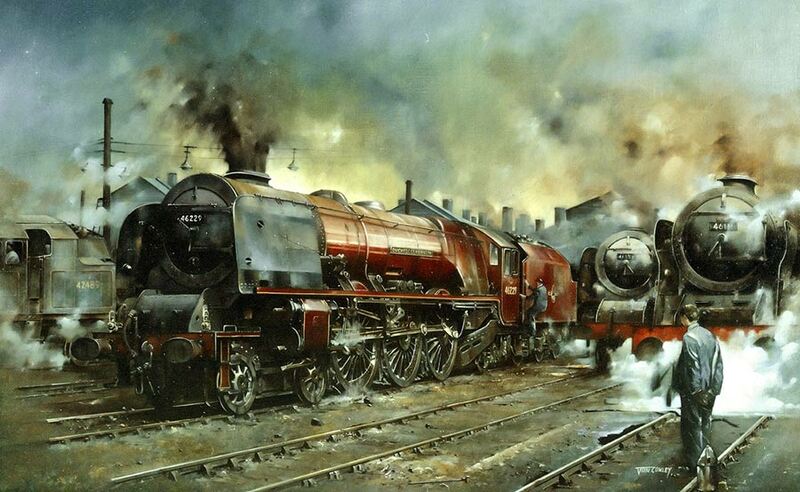 A sister Pacific is alongside and Royal Scot Class 4-6-0 46111 'Seaforth Highlander' releases the pressure. Jubilee Class 4-6-0 'Seychelles' strolls into St Pancras. Black Five 4-6-0 45267 waits to depart with a local bound for Bedford; its own shed. The echoing sound, sight and smells under that roof have never left me, thankfully. Royal Scot Class 4-6-0 46117 'Welsh Guardsman' is almost ready for duty as it proudly waits on 55A Holbeck Yard.